With iSaloni in mind, I thought this photo of the 1969 Kitchen Satellite would make for an appropriate Flashback Friday post. It's orange, it's plastic, it's bizarre—therefore it's got to be an Italian piece, right? Well, no. Designer Luigi [née Lutz] Colani was actually born in Berlin, and he created this sphere-shaped pod for Poggenpohl. 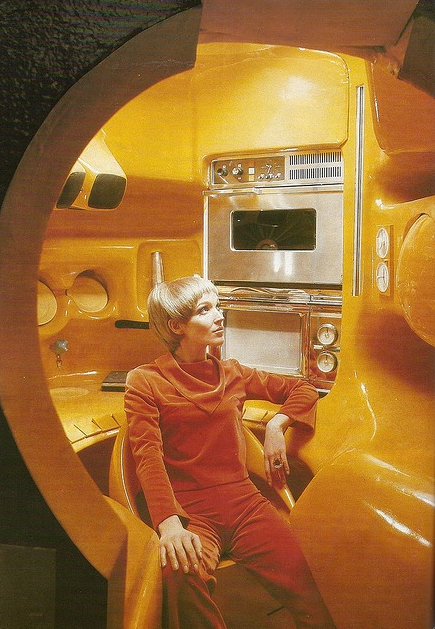 Everything—appliances, storage, equipment—was situated within an arm's reach of the pilot—oops, I mean the chef. A proponent of what he calls 'biodynamic' design, a conjoining of ergonomics, streamlining, and all forms roly-poly, Colani has a most impressive résumé in the automotive- and industrial-design worlds.